Start will be at 8:30 am. Course is one lap of 17.3 km through La Quassa Natural Park up to S. Quirico (a hill overlooking Lake Maggiore), about 85% on off-road track and 15% on paved road. Total positive elevation about 350 m.
IMPORTANT: please arrange to be independent on water availability; the organisation will provide 1 point of refreshment along thee route but this may be not sufficient especially in hot weather conditions. The rules of the “InternationalTennis Federation (ITF)” are applied. Within one team competition, each male and each female player can only take part in one match so each team consists of at least 4 men and 2 women. In one of the double events (man or mixed double), one male player, may be replaced by a female player. In this case, a team consists of at least 3 men and 3 women. The participating teams will be divided into groups. The tournament will start with a “Round-Robin” System. After the group competition, the tournament will continue by another group system or by a “K.O.” system depending from the atmospheric conditions. Start will be at 9:00 am. We will be playing with the same rules as in the former editions of the Atomiade. A team consists of 4 players and up to 2 substitutes (male or female). The players in each team have to be ranked in advance, from strongest to weakest. 12 Active teams and 11 Hobby teams. Separate team tournaments for active club players and for hobby players. Competition setup will be given on the day. 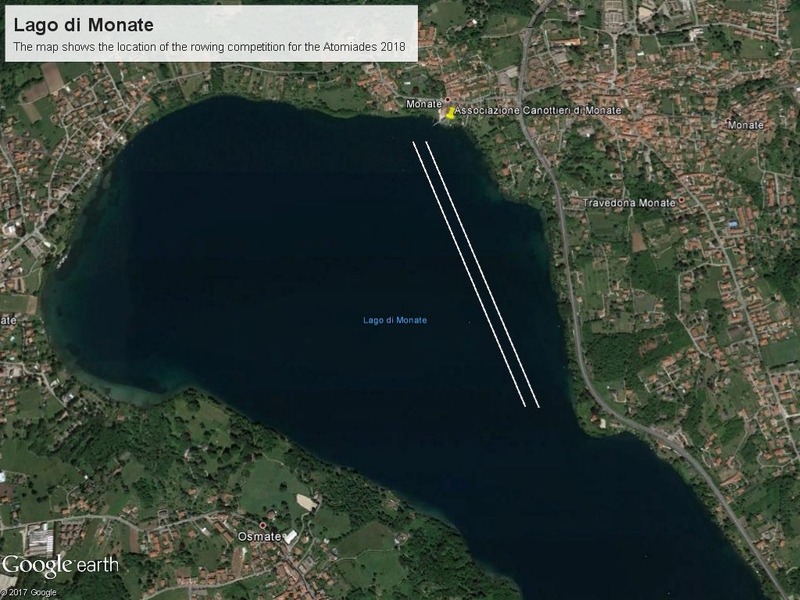 As a new event for 2018 we are offering additionally a 1500 m open water swim, which will be held at Cadrezzate in Lago di Monate on Sunday 10th June @10:30am. No wetsuits are allowed. Max. time allowed in water: 45 mins. Sport pistol cal. 0.22 lr – 25 m. Maximum participants per day: 16. Air pistol cal. 4.5 mm – 10 m. See comment under air rifle below. Small bore rifle cal. 0.22 lr – 50 m. Maximum participants per day: 10. The competition rules are all according to the Asceri rules for shooting competitions. See the links below for further details. The shooting competitions can host a maximum number of 30 participants over two days. More details about the shooting competitions will be provided when the final number of participants have been established at the end of the registration period. Depending on the number of interested parties, we will have mixed crews, both in terms of gender and research institutes. Participants shall bring their own boules. The Mountain bike race will take place on a ca. 3km off-road track with a height difference of about 40 m on a single lap. The race will last about 1 hour (nr. of laps to be determined based on the time needed by the race leader after 2 laps).